Now that we know the relative strength index formula, let’s analyze how to use this powerful indicator. Most traders use the relative strength index simply by buying a stock when the indicator hits 30 and selling when it hits 70. If you remember anything from this article, remember that if you buy and sell based on this strategy “YOU WILL LOSE MONEY”. The market does not reward anyone for trading the obvious. Now that doesn’t mean that simple methods don’t work, but simple methods that everyone else is following have low odds. The RSI provides several signals to traders. In this next section let’s explore the various trade setups using the indicator. The RSI is much more than a buy and sell signal indicator. The RSI can provide you with the ability to gauge the primary direction of the trend. First let’s define the range where the RSI can track bull and bear markets. For bull markets, you want to be on the lookout for signals of 66.66 and for bear markets 33.33. I know this is slightly less than the normal 80/20 or 70/30 readings. These readings of 33.33 and 66.66 were presented by John Hayden in his book titled ‘RSI: The Complete Guide‘. John theorizes throughout the book that these levels are the true numbers that measure bull and bear trends and not the standard extreme readings. It amazes me that more people do not talk about this aspect of the RSI. Again, the RSI is not just about buy and sell signals. What about the fact the indicator is about “strength” and what better use than to measure the strength of the trend. 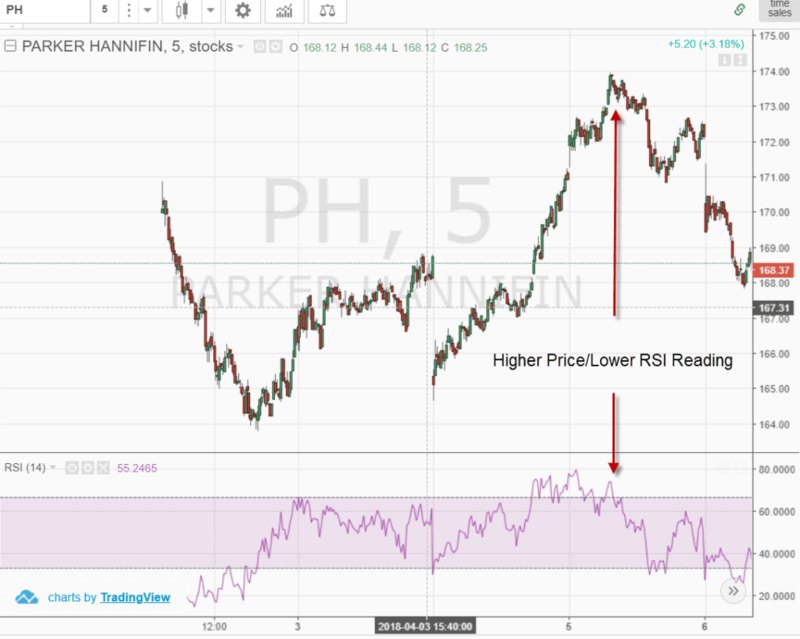 In the above chart example, the RSI shifted from a weak position to over 66.66. From this point, the RSI stayed above the 33.33 level for days and would have kept you long in the market for the entire run. As you can see, the RSI can also define downtrends as well. You just want to make sure the security does not cross 66.66. Now, should you make buy or sell signals based on crosses of 33.33 and 66.66? Not too fast, there is more to the RSI indicator which we will now dive into. Did you know the RSI can display the actual support and resistance levels in the market? These support and resistance lines can come in the form of horizontal zones or as we will illustrate shortly, sloping trendlines. You may not know this, but you can apply trend lines to indicators in the same manner as price charts. 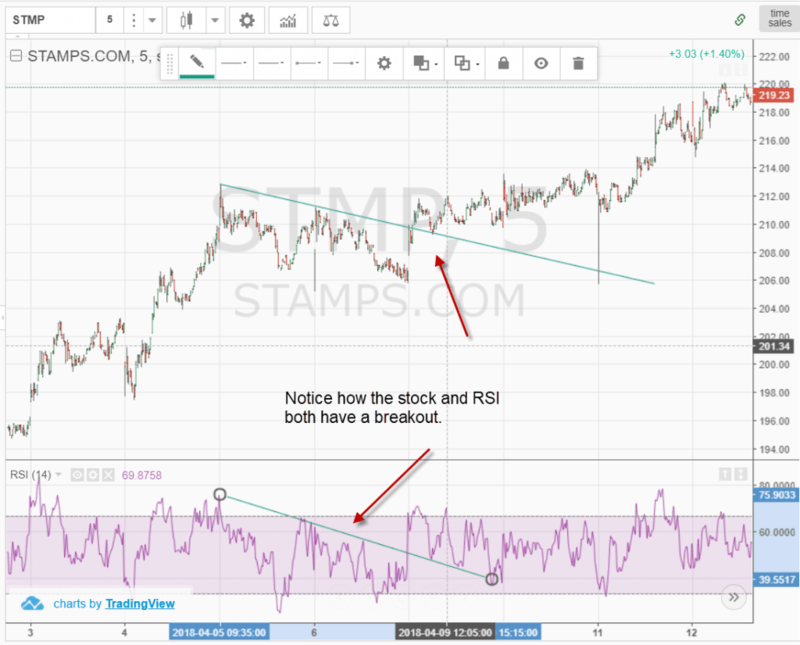 In the above chart, Stamps.com was able to jump significant resistance on the RSI indicator and the price chart. This breakout resulted in a nice run up of over 7%. Let’s take a look at another example where the RSI was able to call a top. It’s not what you are thinking, in that a reading of 90 is a guarantee for a selloff. In this example, the RSI had a breakdown and backtest of the trendline prior to the break in price. 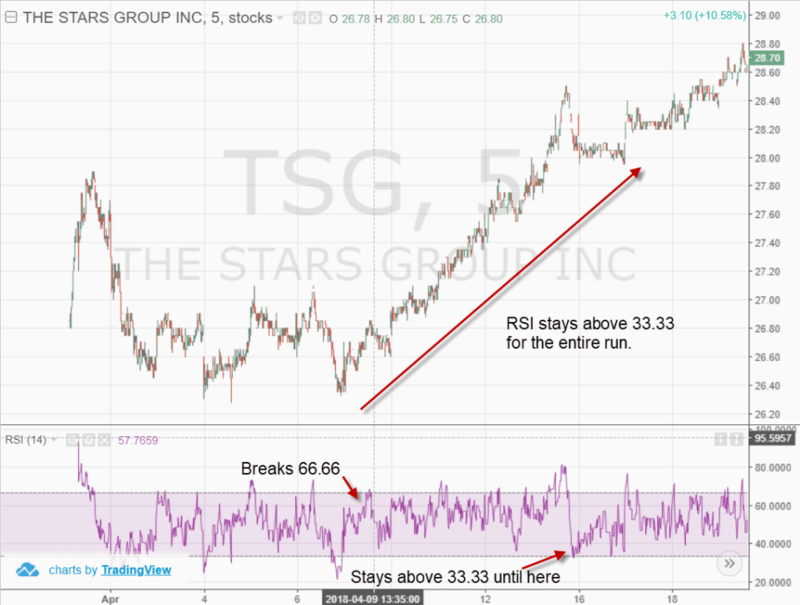 While the stock continued to make higher highs, the RSI was starting to slump. The challenging part of this method is identifying when a trendline break in the RSI will lead to a major shift in price. As expected you will have several false signals before the big move. There is no such thing as easy money in the market. It only becomes easy after you have become a master of your craft. This is an oldie but goodie and is still applicable with the RSI indicator. Building upon the example from the last section, identify times where price is making new highs, but the RSI is unable to top itself. This is a clear example where the RSI is starting to roll as the price inches higher. The first price bottom is made on heavy volume, which occurs after the security has been in a strong uptrend for some period of time. This is the reason as mentioned below, that the RSI has been above 30 for a considerable amount of time. After the first price sell off, which also results in a breach of 30 on the RSI, the stock will have a snap back rally. This rally is short lived and is then followed by another snap back reaction which breaks the low of the first bottom. This second low is where stops are run from the first reaction low. Shortly after breaking the low by a few ticks, the security begins to rally sharply. This second low not only forms a double bottom on the price chart, but the relative strength index as well. The reason this second rally has legs is for (1) the weak longs were stopped out of their position on the second reaction, and (2) the new shorts are being squeezed out of their position. The combination of these two forces produces sharp rallies in a very short time frame. 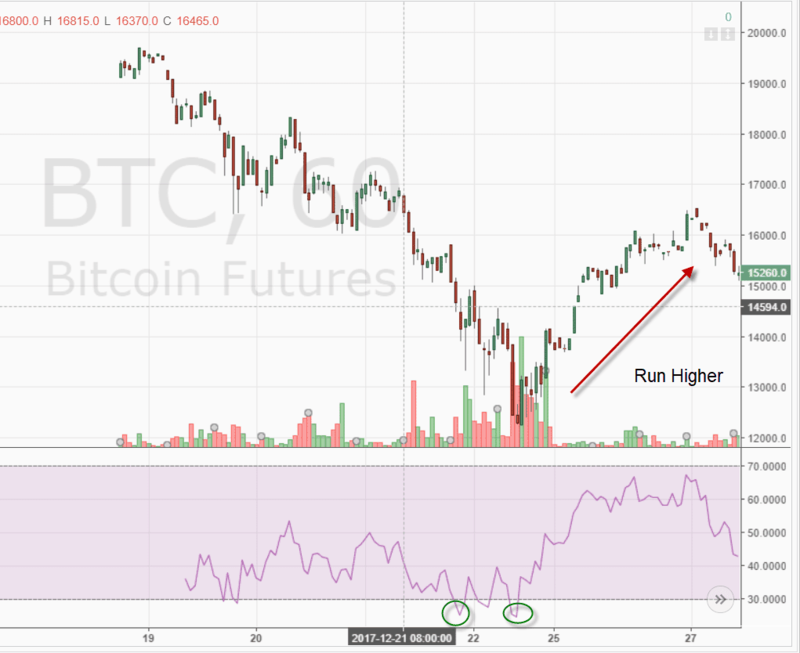 To illustrate this point around double bottoms, have a look at the below chart of Bitcoin futures. The tricky part about finding these double bottoms is after the formation completes, the security may be much higher. I can’t tell you how many times I would purchase the second low before the rally up, only to have the security head lower. You are going to need tight stops to avoid ending up on the wrong side of the trade. As I mentioned earlier, it is easy to see these setups and assume they will all work. What people do not tell you is that for every one of these charts that play out nicely, there are countless others that fail. It only takes one trader with enough capital and conviction to make mincemeat out of your nice charts and trendlines. If you want to assess the broad market, I have been reviewing an interesting approach of applying the RSI to the McClellan Oscillator. 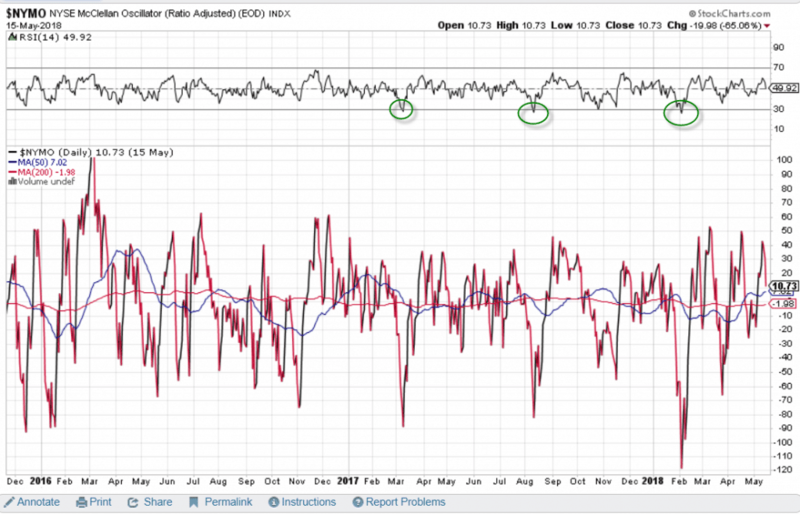 For those not familiar with the McClellan Oscillator, please visit this article for more details. Essentially the McClellan measures the advancing and declining issues across the NYSE. This won’t help you much day trading, as this sort of weakness in the broad market only occurs a few times a year. However, if you are in the middle of a day trade, you can prepare yourself for the tidal wave that’s coming. It’s amazing how applying a strength measurement to a broad market indicator can reveal when weakness hits a tipping point. Although the RSI is an effective tool, it is always better to combine the RSI with other technical indicators to validate trading decisions. The strategies we will cover in the next section of this article will show you how to reduce the number of false signals so prevalent in the market. 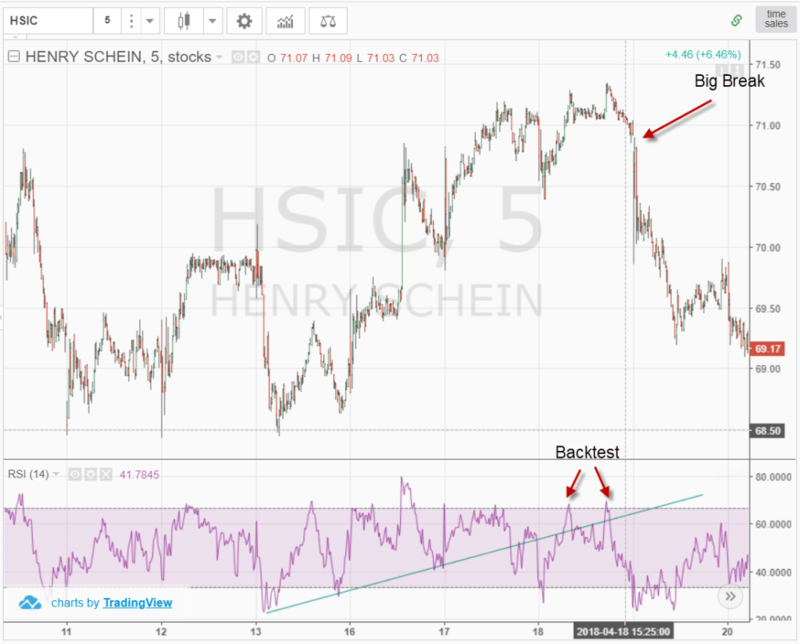 In this trading strategy, we will combine the RSI indicator with the very popular MACD. We will enter the market whenever we receive an overbought or oversold signal from the RSI supported by the MACD. We will close our position if either indicator provides an exit signal. This is the 10-minute chart of IBM. In this relative strength index example, the green circles show the moments where we receive entry signals from both indicators and the red circles denote our exit points. A bit more than an hour after the morning open, we notice the relative strength index leaving an oversold condition, which is a clear buy signal. The next period, we see the MACD perform a bullish crossover – our second signal. Since we have two matching signals from the indicators, we go long with IBM. We appear to be in the beginning of a steady bullish trend. Five hours later, we see the RSI entering oversold territory just for a moment. Since our strategy only needs one sell signal, we close the trade based on the RSI oversold reading. This position generated $2.08 profit per share for approximately 6 hours of work. In this trading strategy, we will match the RSI with the moving average cross indicator. For the moving averages, we will use the 4-period and 13-period MAs. We will buy or sell the stock when we match an RSI overbought or oversold signal with a supportive crossover of the moving averages. We will hold the position until we get the opposite signal from one of the two indicators or a divergence on the chart. This is the 15-minute chart of McDonald’s. RSI enters the oversold area with the bearish gap the morning of Aug 12. Two hours later, the RSI line exits the oversold territory generating a buy signal. An hour and a half later, the MA has a bullish cross, giving us a second long signal. We buy McDonalds as a result of two matching signals between the RSI and the MA Cross. McDonald’s then enters a strong bullish trend and 4 hours later, the RSI enters the overbought zone. At the end of the trading day, we spot a bearish divergence between the RSI and McDonald’s price. Furthermore, this happens in the overbought area of the RSI. This is a very strong exit signal and we immediately close our long trade. This is a clear example how we can attain an extra signal from the RSI by using divergence as an exit signal. This long position with MCD made us a profit of $2.05 per share. Now I will show you how to combine the relative strength index with the relative vigor index. In this setup, I will enter the market only when I have matching signals from both indicators. I will hold the position until I get an opposite signal from one of the tools – pretty straightforward. This is the 15-minute chart of Facebook. In this example, we take two positions in Facebook. First, we get an overbought signal from the RSI. Then the RSI line breaks to the downside, giving us the first short signal. Two periods later, the RVI lines have a bearish cross. This is the second bearish signal we need and we short Facebook, at which point the stock begins to drop. After a slight counter move, the RVI lines have a bullish cross, which is highlighted in the second red circle and we close our short position. This trade generated a profit of 77 cents per share for a little over 2 hours of work. Facebook then starts a new bearish move slightly after 2 pm on the 21st. Unfortunately, the two indicators are not saying the same thing, so we stay out of the market. Later the RSI enters oversold territory. A few periods later, the RSI generates a bullish signal. After two periods, the RVI lines also have a bullish cross, which is our second signal and we take a long position in Facebook. Just an hour later, the price starts to trend upwards. Notice that during the price increase, the RVI lines attempt a bearish crossover, which is represented with the two blue dots. Fortunately, these attempts are unsuccessful, and we stay with our long trade. Later the RVI finally has a bearish cross and we close our trade. This long position with FB accumulated $2.01 per share for 4 hours. In total, the RSI + RVI strategy on Facebook generated $2.78 per share. Here I will use the RSI overbought and oversold signal in combination with any price action indication, such as: candlesticks, chart patterns, trend lines, channels, etc. In order to enter a trade, I will need an RSI signal plus a price action signal – candle pattern, chart pattern or breakout. I will hold every trade until I get a contrary RSI signal, or price movement that the move is over. This is the 30-minute chart of Bank of America. The chart image starts with the RSI in overbought territory. After an uptrend, the BAC chart draws the famous three inside down candle pattern, which has a strong bearish potential. With the confirmation of the pattern, we see the RSI also breaking down through the overbought area. We match two bearish signals and we short BAC. The price starts a slight increase afterwards. This puts us into a situation, where we wonder if we should close the trade or not. Fortunately, we spot a hanging man candle, which has a bearish context. We hold our trade and the price drops again. Look at the three blue dots on the image. These simple dots are enough to build our downtrend line. After we entered the market on an RSI signal and a candle pattern, we now have an established bearish trend to follow! The trend resists the price (yellow circle) and we see another drop in our favor. After this decrease, BAC breaks the bearish trend, which gives us an exit signal. We close our position with BAC and we collect our profit. This trade made us 20 cents per share. If you are new to trading, combining the RSI with another indicator like volume or moving averages is likely a great start. Pairing with the indicator will give you a set value to make decision and removes a lot of the gray areas associated with trading. Once you progress in your trading career, you will want to look to methods using price action that are more subjective but being able to apply techniques specific to the security you are trading will increase your winning percentages over time. But again, this level of trading takes a ton of practice over an extended period of time. The RSI is a momentum indicator. RSI oscillates between 0 and 100 providing overbought and oversold signals. Readings above 70 are considered bullish. Readings below 30 are considered bearish. John Hayden promotes two key levels 33.33 and 66.66. 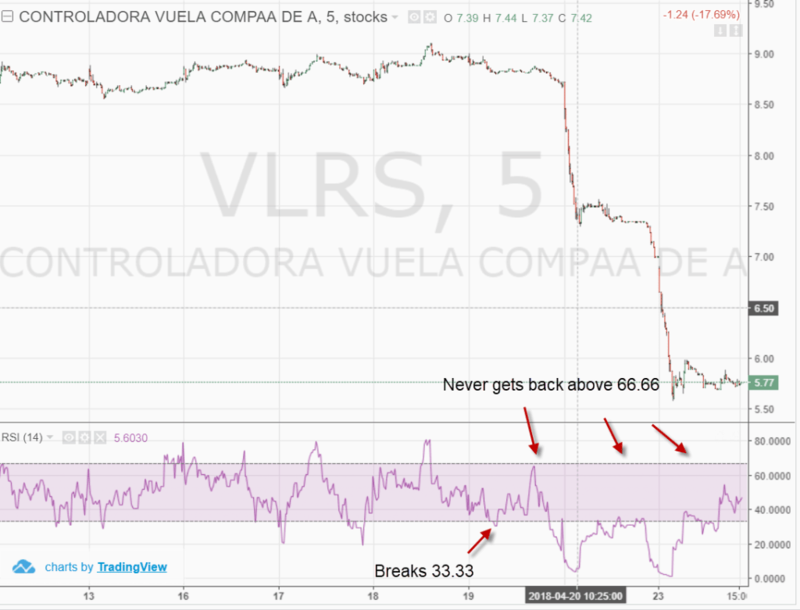 Stop loss orders are recommended when trading with the RSI. RSI should be combined with other trading tools for better signal interpretation. For more information on the RSI, check out this youtube video which provides further clarification. This informative article appeared on tradingsim.com and is available here.